This is the first of three posts in a 'Countdown' series leading up to March 21, 2011. For on that night, I shall finally experience live and in person one of the few artists who have forever shaped my musical adoration: Ms. Janet Jackson. I will be in live attendance for one of a series of shows Ms. Jackson will be performing at the legendary Radio City Music Hall here in New York City, in support of her latest 'greatest hits' package Number Ones. The concert will be extra special because unlike other tours which are usually in support of a particular album release, Janet will be focusing on showcasing her hits (and we all know she's got a ton of 'em). Her career is currently in its fourth decade, and now ten albums of original material strong. Janet has proven her worth time and time again, not just as an artist, performer and songwriter, but also as a sophisticated and downright commendable woman of class and integrity. Considering I was born in the late 80's, and was just a little too young to be fully submerged in the impact made by her older brother(s), it was Janet who had the first and deepest impression on me of the Jackson clan, beginning first with 1993's janet. The album was one of the very first CDs in my collection, and looking back on it now, it's hardly the type of material a typical six year-old would be devouring. Blame it on my older cousins, who would blare "Funky Big Band" while babysitting me but the rhythm took me over, and my interest in Janet began to outweigh your typical childish desire to want to be like her elders. I didn't truly appreciate janet. until I was a teenager, when I revisted it, along with 1986's Control, 1989's Janet Jackson's Rhythm Nation 1814, and 1997's The Velvet Rope after I gained word that my bubble-gum boy band of choice -- *NSYNC -- would be opening up for her on tour. The adoration stuck, and regardless of career highs and lows, acting choices, weight fluctutations, bad press, good press, and everything in between, Janet Jackson has remained one of the few staples in my music collection, and one of the few artists who has multiple albums under her belt that I find downright fundamental to any music fan's collection. In my excitement leading up to this sure to be life-changing night, I shall be reminiscing about my Top 3 Janet songs of all time -- a decision-making challenge of epic proportions. There's a million songs that could be my favorite Janet song, and my personal feelings on the subject change with the day, hour and minute. She has songs for when you're sad, songs for when you're happy, songs when you just wanna dance, songs for when you want to cry it all out. Janet's got a little something for everyone. Tunes like "Miss You Much", "Black Cat", "All For You", "What Have You Done For Me Lately", "Feedback", "Together Again", "Go Deep", "That's The Way Love Goes", "Let's Wait A While" -- they all have a different story and a different meaning to me. They are all essential. To narrow it down to just three is semi-impossible, but I've done my very best to pinpoint my absolute favorites, bar none. I can't really explain my attachement to this song, other than it began in my single-digit years. I heard the song once, and found it so haunting it seemed to follow me throughout my life. It's a shining example of what a team Janet makes with Jimmy Jam and Terry Lewis as songwriters, as it is the epitome of relatable; soft, tender and yet heartbreakingly vulnerable and sad while being tearfully optimistic. In terms of beautiful tearjerkers, it doesn't come more striking than "Again". 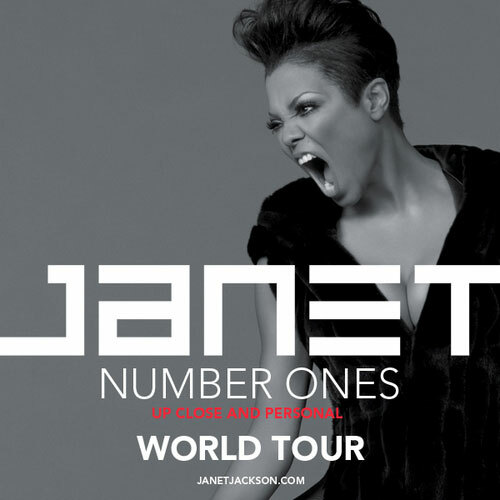 For more info on Janet's tour, click here. "Again" is such a great song, and while it captures a specific time for me, it really is a timeless song.